The book is called Wildwitch: Wildfire, and it’s by Lene Kaaberbøl (and it’s translated by Charlotte Barslund). It’s about this girl called Clara, and she’s very shy – and one day a cat attacks her, and there’s blood everywhere! She has to go to her Aunt Isa and learn Wildwitch Self-Defence 101, but one day when her Aunt isn’t at home, the Chimera (an evil used-to-be-Wildwitch) attacks the house and kidnaps Clara! After that, she has to go through a series of ancient trials in court to prove she’s telling the truth and become a proper wildwitch. Some bits were OK, and some bits were a little violent (Death Death Blood Blood! ), but overall I liked it. I’d definitely recommend this book to kids who are obsessed with all of that killing and stuff like that (even if the characters just talk about it more than do it!). Towards Mum her voice was completely different – so sharp that you could cut yourself on it. It wasn’t exactly a difficult question, but Mum didn’t reply. Gradually it becomes clear that Clara is a special girl, and the time has come for her to learn to deal with her fate. But what if she doesn’t want to? 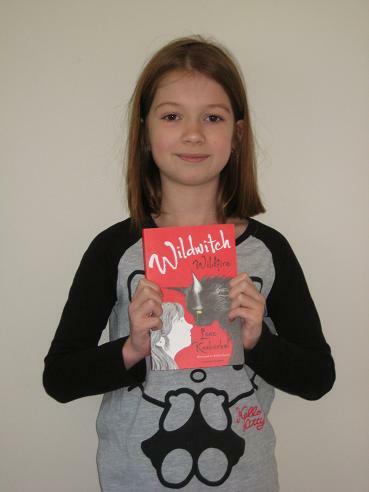 The world of the wildwitches is a dark and dangerous one, and with the dangerous Chimera after her, Clara has to go through a double ordeal of growing up quickly in public while proving that she is worthy of the title of wildwitch. There are many dangers for her to face, and a little blood is shed (perhaps a little too much for my delicate little reader…) – will the frightened girl be able to pass the test she is set? Today’s bonus shot feature is a little different as we’re looking not at a country but at some of the children’s books Emily has reviewed over the past couple of years. For last year’s Women in Translation Month, she tried Tove Jansson’s The Moomins and The Great Flood, and even though the Moomins series dates back a while, modern children should still enjoy them. However, most of the books my little helper has tried have come from Pushkin, and there have been a couple of others by female writers. Eva Furnari’s Fuzz McFlops was a funny little story of a picky rabbit finally finding love, but one of Emily’s real favourites was Annie M.G. Schmidt’s The Cat Who Came in off the Roof. In this one, a cat turns into a woman and turns the life of the man who ends up helping her upside down. Emily is also in the middle of Argentine writer María Elena Walsh’s An Elephantasy (and enjoying it! ), so watch out for a review of that in the near future. This is a lovely review! How wonderful to have Emily reading along. And also to be introduced to Pushkin’s children’s range, as I was previously unaware of its existence!